If you operate a visual business — think bakery, coffee shop, clothing line, etc. — and you don’t have a business profile on Instagram, you might be missing out on a large, interested audience. Regardless of whether you’re using Instagram for social advertising or just the organic reach, it’s a platform you can’t ignore. 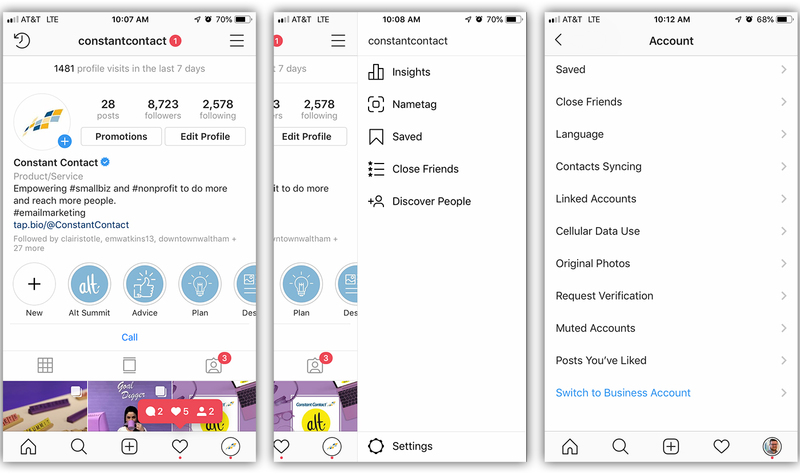 Instagram rolled out business profiles in 2016, and Constant Contact was one of the first businesses to gain hands-on access to the new features. Having a business profile gives you access to a variety of tools and functionality, including analytics on your posts and stories, additional calls-to-action and buttons you can put on your profile, and third-party integrations with services like MINDBODY, which are constantly in development. Let’s walk through how to change your Instagram account to a business account and explain the advantages for your small business. Once you’ve clicked on the ‘Switch to Business Account’ button, you’ll be guided through the details and prompted to add additional contact information to your profile. There are some steps you can skip, but others that you have to fill out in order to have a business account. Note: You can undo this process! After you are done, a ‘Return to Personal Account’ option will replace the ‘Switch to Business Account’ link in your settings. If you have a Facebook page for your business, you’ll want to connect your account with your Facebook business page. Then, update your business’ contact information, including your email address, phone number, and address. 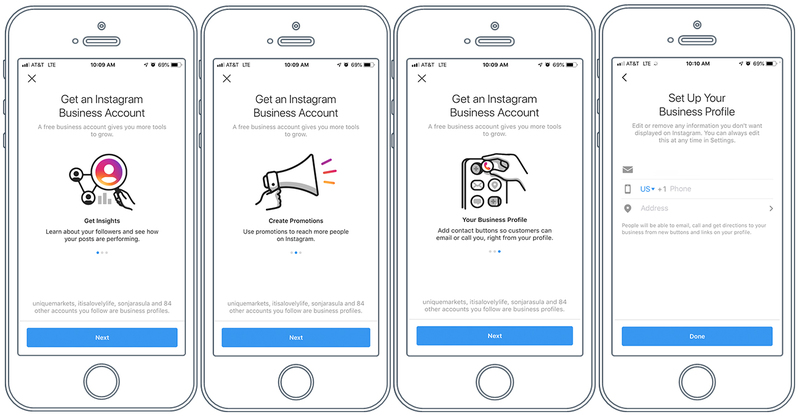 Once you complete these steps, your account is now officially switched to an Instagram business profile! Once you provide contact information for your business account, a contact button will appear in your profile. Instagram users simply have to click that button and then chose whether they want to email you, call you, send a message, or find your location. Instagram was one of the last major social networks to introduce analytics tools, and they are still relatively minimal (e.g. don’t expect the ability to export data or to track over periods of time longer than a week). 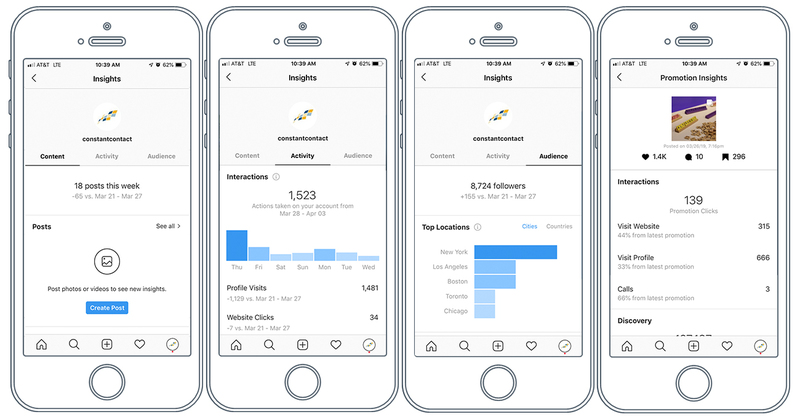 While the Instagram business analytics tools — which are called Insights — aren’t robust, they are a convenient way for you to get a quick look at how your Instagram content is working for you. 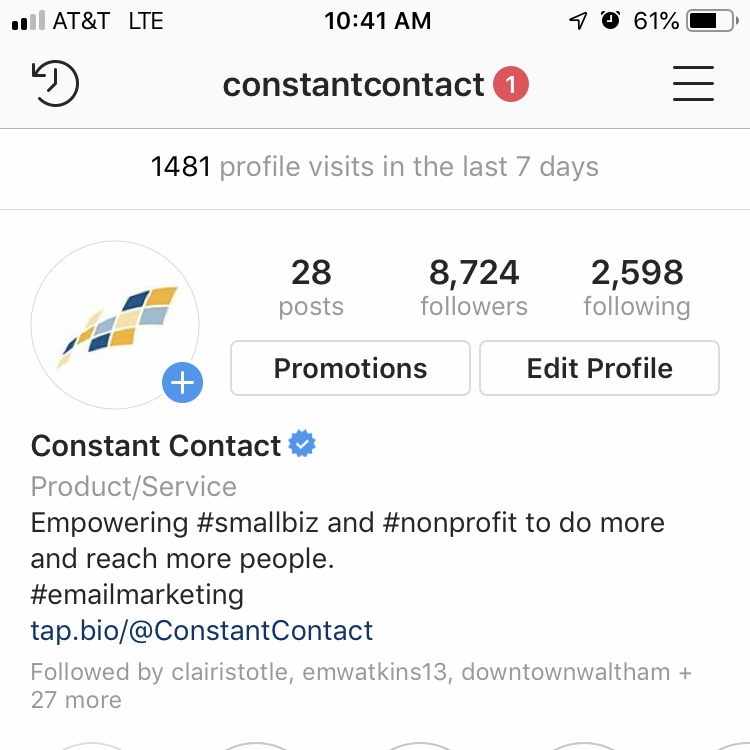 You can get an overall view of your Instagram posts by going to your profile and clicking the Insights data listed on the top of your account. When you go to the Insights section, you’ll see analytics for impressions, reach, and follower information within the past week. Your top posts in the last seven days are shown next. Click See More to view these post sorted by top impressions. If you want to view analytics for one of the posts, start by clicking on it. Then, click View Insights to see the impressions, reach, and engagement for the post. Follower information is at the bottom of the Insights section. You’ll see a chart for the current day of the week, and which hours of the day are most active for your Instagram followers. You can also see information on your current follower number, the breakdown in gender of your followers, an age range, top locations of your followers, your followers’ active hours of the day for each day of the week, and your followers’ active days of the week. You can also access insights by clicking on an individual Instagram post, and then clicking the View Insights link. 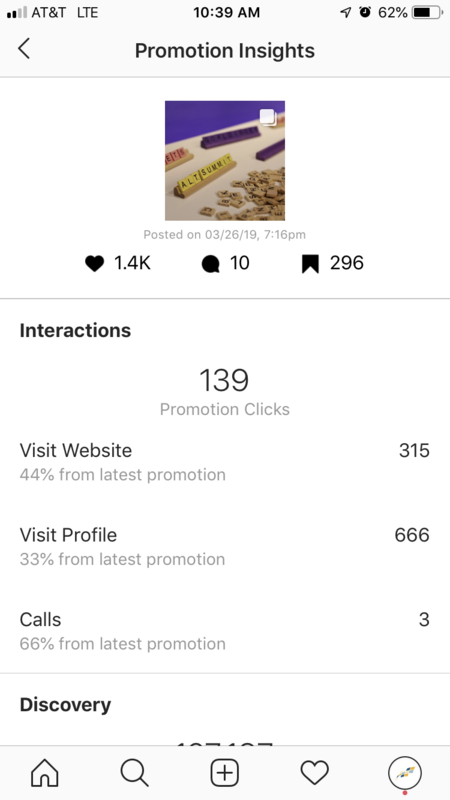 Instagram will show you the impressions, reach, and engagement for that individual post. If you want to promote a post, click on it and then select Promote. In our experience, the time from ad creation to full promotion can range from a few hours to a day or more, as Instagram takes important steps to verify advertising on its platform. As you walk through the process, Instagram may require you to connect or authenticate with your Facebook account before purchasing. From there, you can select text for a call to action button, choose a specific audience, set your budget, and choose a time period for your ad to run. Instagram’s algorithm is changing how and when users see the content you post. Upgrading your Instagram account to a business profile can help you beat the odds. Access the Insights tools to find out what content is working for you, what content to create in the future, and when to share it to get seen and get engagement. Try promoting one of your best-performing posts with the ads tools to get your content in front of more people, and promote your profile. 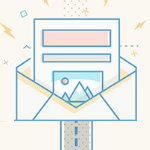 You’ll increase engagement and followers, and these users may be more likely to interact with and purchase from your business directly with the new contact button on your business account. Just getting started with Instagram? Visit our Instagram 101 Page to learn more. Your privacy is important to us. We will not sell, rent, or give your name or email address to anyone.